My two favorite cosmetics are Archimedes and Giddeon, but if you ignore the birds then my favorite wearable has to be the Ball-Kicking Boots. Generic-looking, yes, but they spawn a soccer ball for your team. In my opinion this trumps any possible visual bonuses from anything else. A free soccer ball has a whole host of uses, almost none of them combat-oriented. Here are some opportunities no other cosmetic will give you. 1. Give your whole team something to do while stuck in spawn. If you’ve played TF2 for any amount of time, you’ve probably gotten bored while confined to a tiny BLU spawn room watching a counter tick down from 60 seconds. Your teammates feel the same, trust me. But not any more! Switch to scout for a second and then go back to your original class. Then type “BALL IN BLU SPAWN!” and watch your teammates go nuts on the poor soccer ball. Go nuts on the poor soccer ball yourself. Just like in real life, a ball to kick around makes waiting way more fun. 2. Be the life of the party during a picnic or no-damage party. This tip only applies to people who enjoy jumping into server-wide détentes for some taunting, player-stacking, and airblast/sandvich parties that seem to crop up. More often than not, their fragile truces are shattered because someone has a hard time resisting the lure of firing the lethal weapons in their disposal. Well, a soccer ball can go a long way towards assuaging their gunlust. Just be wary of hitting people who chose to melee the ball. 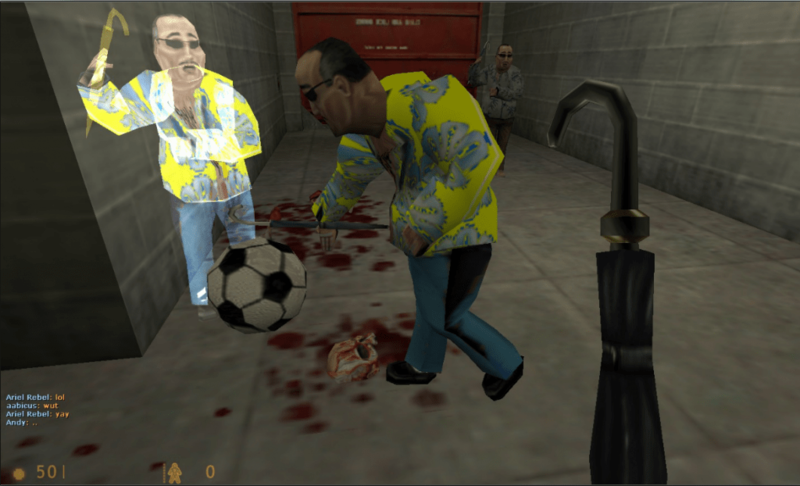 Team Fortress Classic knows that soccer balls make everything fun! 3. Be the “Stop having fun guy” during a srs matchup. This tip applies to everyone who doesn’t think the last tip applies to them. Sometimes, you’re trying to win, and maybe you don’t like the pan scouts wasting time hitting your soccer ball in spawn. The least they could be doing is eating bullets for the rest of us, right? Well the Short Circuit has you covered. Simply shoot the ball and it’ll vaporize. Then you can go back to playing your game while the traumatized chats of your teammates serve as music to your tryhard ears. 4. Stop the train on its tracks in cp_freight. What? This wasn’t hard to replicate, and made the map almost impossible to end, especially if you graciously offered Train Protection® to both team’s final point. Sadly, this particular use has since been patched, so I’m quite glad I milked most of the fun out of it while I had the chance. 5. Have softer footsteps. The Ball-kicking boots changes your footsteps to that of cleats. Experts aren’t in complete agreement, but the general consensus is that they do this because you are now wearing cleats when you equip them. But this matters because the cleats are actually slightly quieter than the stock footsteps, which is important to an ambushing class like yourself. So find yourself a pair, and learn just how fun a soccer ball can be. There’s a reason Birthday Mode sticks a Beach Ball into every map. Next Next post: “Mirrored Maps” event results!